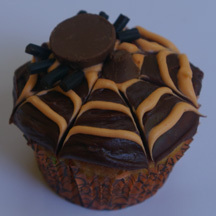 Long strands of stiff licorice give this Halloween spider a spooky reach. Use chocolate frosting, sprinkles and M&M eyes to make him even tastier. What You Need: 1 cupcake; chocolate frosting; chocolate sprinkles; black (or dark brown) M&Ms; black licorice (strand style); knife or kitchen shears. How to Make It: Frost cupcake. Sprinkle with chocolate jimmies. Place two black M&Ms, letter side down, for eyes. Cut licorice into eight equal strands and insert into cupcake for legs.